+ In my understanding, the channel response in the book is in time domain, we assume flat fading and the common model is Rayleigh fading model. + But if we use OFDM, how can we model the channel? In the paper “Non cooperative cellular wireless with unlimited numbers of base station antennas”-M. Marzetta, the author talked about OFDM, they consider at one sub-carrier, and the model is still the same with Rayleigh fading model (just channel response multiply with signal) ==> Is the channel now in the frequency domain? Because I think we use convolution instead of multiply channel response with signal in frequency-selective fading. My book and also Marzetta’s works are based on the block fading channel model, which is a simplification of reality. In this model, we consider a flat-fading time-invariant channel with a coherence block, thus the channel is described by an impulse response h*delta(t) in the time domain and h in the frequency domain, where delta(t) is the Dirac delta function. So h is the coefficient that describes the channel. In OFDM, the coherence block can be approximately viewed as spanning a certain number of subcarriers in the frequency domain and OFDM symbols in the time domain. This is what Marzetta describes in his book. 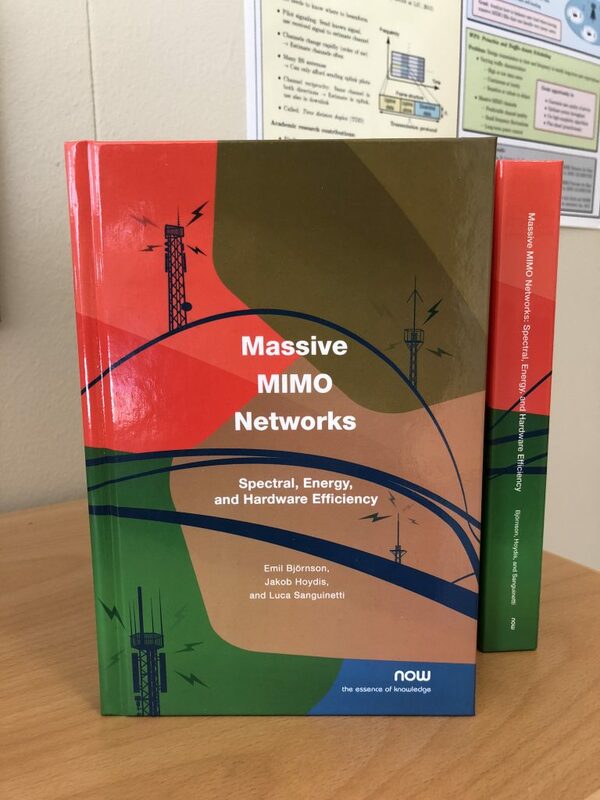 There are many other relevant papers on OFDM in Massive MIMO which you can find in the reference lists of the two papers above. There is one thing I still do not get is that the channel model. For example with a frequency selective fading L-taps, we have the channel response in time domain: h = [h_1, h_2, … h_L], each of tap h_i will follow the Rayleigh fading, h_i ~ CN(0,1). So the received signal in time domain: y[n] = x[n](*)h + w(n) with (*) is convolution. Change this model to frequency domain: Y[k] = X[k]*H[k] + W[k]. with * is conventional multiplication ==> what is the model for H[k], does it still follow ~ CN(0,1). ==> In your book, the channel h ~ CN(0,1) which is Rayleigh fading and in my understanding, Rayleigh fading is in time domain, but when we change to frequency domain, what happens? For an L-tap channel, you can check out the first of the two papers that I referenced to. G^m_k(s) is the channel on subcarrier s between antenna m and user k. It is formed by taking the L-tap channel between antenna m and user k, and then compute an inner product with a vector that comes from a DFT matrix. Since this is a weighted sum of Gaussian channel taps, it will also be Gaussian distributed. It will be i.i.d. between antennas/users, but correlated between subcarriers. Regarding my book, let’s recall my previous answer: In my book “we consider a flat-fading time-invariant channel with a coherence block, thus the channel is described by an impulse response h*delta(t) in the time domain and h in the frequency domain, where delta(t) is the Dirac delta function. So h is the coefficient that describes the channel.” Hence, if h is iid Rayleigh fading, this occur in both the time and frequency domain.